Entrigue Magazine brings you articles on today's music and dance artist, fashion designers, and rising stars of tomorrow. 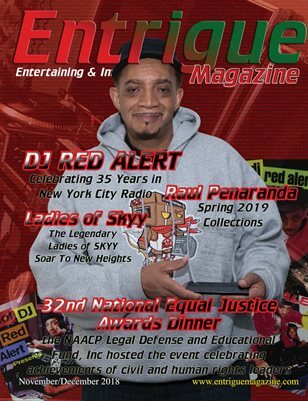 In this issue you'll find Kool DJ Red Alert celebrating 35 years in New York City Radio and receiving Entrigue Magazine's EM Life Time Achievement Award. You'll also find the Ladies of Skyy, Spring 2019 collection from Raul Penaranda, highlights from the 32nd National Equal Justice Awards dinner hosted by the NAACP LDF, and much much more.